Enhanced Interior Gateway Routing Protocol (EIGRP) is a dynamic routing network layer Protocol which works on the protocol number 88. EIGRP supports classless routing, VLSM, route summarization, load balacing and many other useful features. It is a Cisco proprietary protocol, so all routers in a network that is running EIGRP must be Cisco routers but now EIGRP is moving towards becoming an open standard protocol. EIGRP exchange messages for communication between the routers operating EIGRP. There is small topology in which there are 3 routers (on which user will configure EIGRP) namely GfGNoida, GfGDelhi, GfGBangalore. 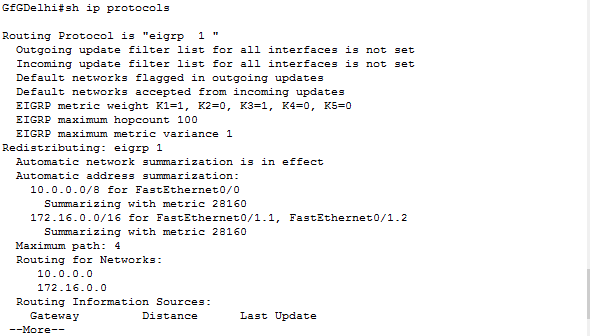 As seen, GfGBangalore router has to advertise the networks 10.10.10.0/24, 10.10.11.0/24, 172.16.10.0/30, 172.16.10.4/30. Therefore now configuring EIGRP for router GfGBangalore. This is a simple configuration in which user has to write the network I’d of the network to be advertised with network command. the autonomous system is same on all routers (as configured 1). the default K values are used (10100) as shown in the above figure. Also, no ACL has been applied. The problem occurring in this scenario is network updates are being summarized. Why? Therfore, user have to disable the auto-summary command on all routers. 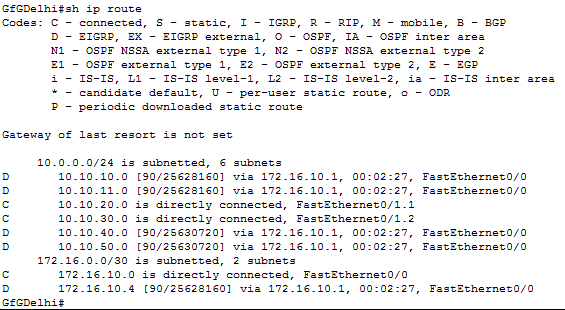 Similarly, on routers GfGDelhi and GfGN, no auto-summary commands will be configured. Now, user can see that all the correct routes are exchanged (not the summarized routes).